View from site of outside toilet looking S towards house. Friday we continued to dig down through a 2m x 1m part of a grid square between the garden/farmyard wall, the probable path to the outside toilet, the probable path to the front door, and the front of the house. This was clearly where they dumped much of their rubbish. Practically every scrape of the trowel yielded finds – about 10Kg of just the small finds! and a wadge of soggy paper-like material with a high fibrous content. A strange shaped large piece of iron, which disappeared underneath last week’s corrugated iron sheet, was excavated. 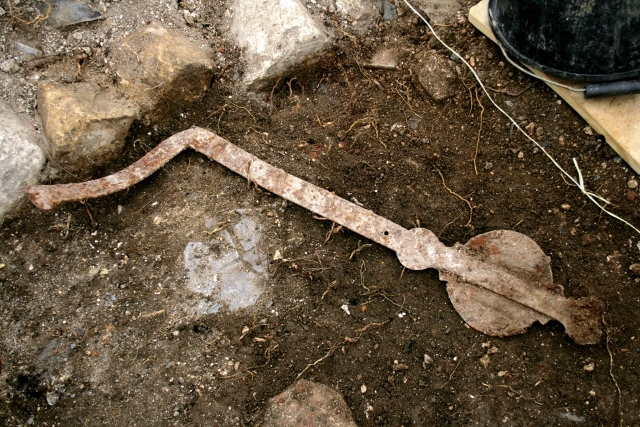 It was about a metre long, ‘L’ shaped and with a circular iron ‘plate’ welded on to it just below its top. Between the circular plate and the base of the ‘L’ were two widely spaced fixing holes. It may have been attached to the back of a vehicle or waggon and held a reflector or light. 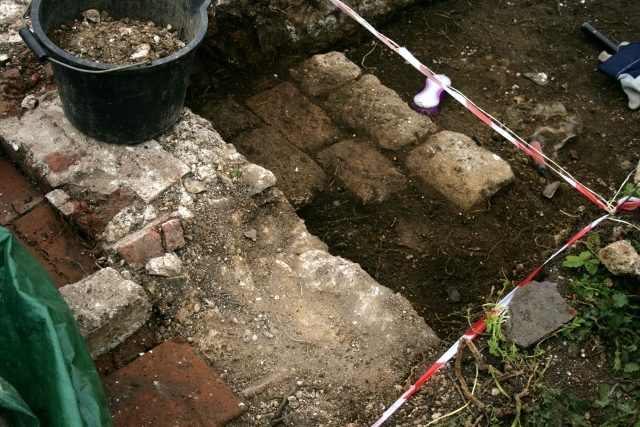 The very front of the house was found to have 3 horizontal courses of roughly squared blocks of unmortared stone, underneath 20-30cm of demolition & rubbish fill, all embedded in a dark brown loamy garden soil (the bottom of which we have yet to excavate). However the stones stopped before where we conjecture part of the front door may have been. Lying on top of this fill an iron water-pipe had been found heading across the front of the house from the adjacent farmyard. 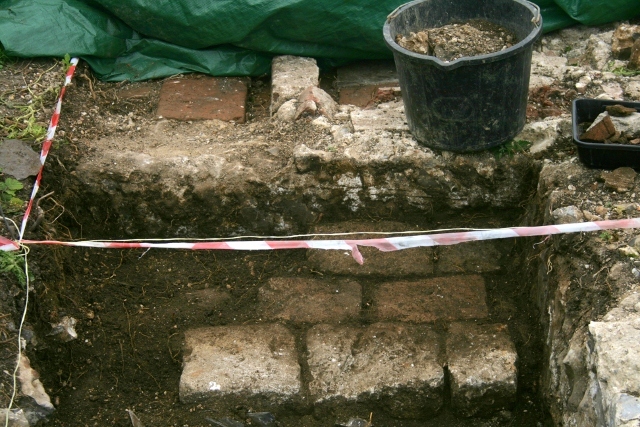 The farmyard portion was clearly in-situ, and it meets the front of the house at about the same level as the floor of the house itself. Unfortunately the 1950’s bulldozer has cut through it at this point, so its further course in front of the house is uncertain. There was no sign of any path leading to our possible front door. 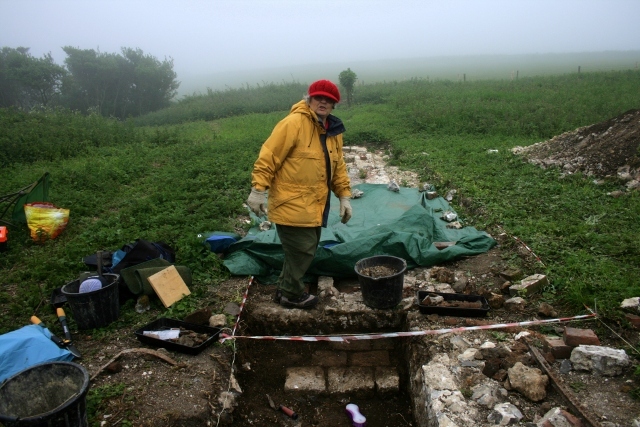 Perhaps it was in the next grid square which has yet to be excavated. For the time being the house frontage remains a mystery.